I am not a patient person. Anyone who reads my blogs might recall my ongoing battle with patience. So I wasn’t sure how I’d do taking on my new hobby-furniture painting. I watch a lot of HGTV. A lot. I have decided that in my next house I’m either having Joanna Gaines from “Fixer Upper” decorate my entire home or Candice Olsen. I think my style is more JoJo than Candice though. The budget – well it’s more do it yourself at this point! I’ve tried hard not to look at the tired furniture in my house. I’ve tried to cover it with knock knacks and dust. I keep the lighting low but it’s no use my furniture looks like crap. Being that we have no money to buy new stuff (I’m saving for a new mattress-Ours matteress is crappy too) I decided I needed to do a little fixing up of what we had. Ok also hubby and I decided that we didn’t want to get new stuff until teens had left the premises bc teens, as it turns out, are harder on furniture than little kids -maybe bc they weigh more- I don’t know but they are tough-or we have elves that are wrecking my house. Case in point: recently my son told me he broke his box spring. Ok – I asked-how did that happen. He doesn’t know. An elf named I dunno- see? Well have fun sleeping on the broken bed I hope the thing doesn’t mysteriously blow up. I have peeling “leather” chairs and scratched coffee tables – ok the dogs may have done a bit of scratching -but you get the point. I think I’ll just live with the crappy stuff now and when the kids are gone maybe we will get some new good crap. I realized that if I wanted some of the crappy furniture to look better I needed to fix it myself. I decided to take me inspiration from Lara Spencer from HGTVs “I Brake for Yard Sales” and “Flea Market Flip”. Those shows show some great salvaging and repurposing of crap. (I told you I watch a lot of HGTV). I could do this. I could make our crap look less crappy. I loved the looks she came up with on her show and man she can make crappy happy! I decided to start with our bedroom furniture. I figured if I messed it up entirely it would be in our room so only Kevin and I would see it regularly. Plus that set had been with us about 17 years and it was looking very worn. My planning phase began months ago. In that I began to think about painting the set. I didn’t actually do anything to prepare for the project. My thinking phase lasted a long time this time. I’m usually much more impulsive. I figured the delay was perhaps because I felt guilty about painting nice wood furniture. I really did -even though it looked bad. I pulled the trigger after I saw a friends guest room and they had taken some old furniture and painted it and the room had such a cute beachy vibe. I left their house and decided it was game on. I’m not new to painting furniture really. I’ve painted stuff before all very poorly – no quality control-and most of it was for outside. It still is outside and a couple pieces look ok. But painting a bedroom set was a bigger deal. I wanted to make sure that I did it correctly and it would look nice. So I consulted the internet. The world of answers to all things. What the heck did I ever do without the internet? I suppose in this case I would have asked someone I knew who had done this sort of thing before. But the internet- it gave me infinite options to painting my furniture. I could watch it on Youtube, pin pages on my Pinterest, I could have glazed furniture, distressed, shabby chic…I got a bit confused! I decided for this project to go straight paint- no frills. I bought the supplies put them in the garage and went to the beach for a week. No sense in rushing it. So unlike me. 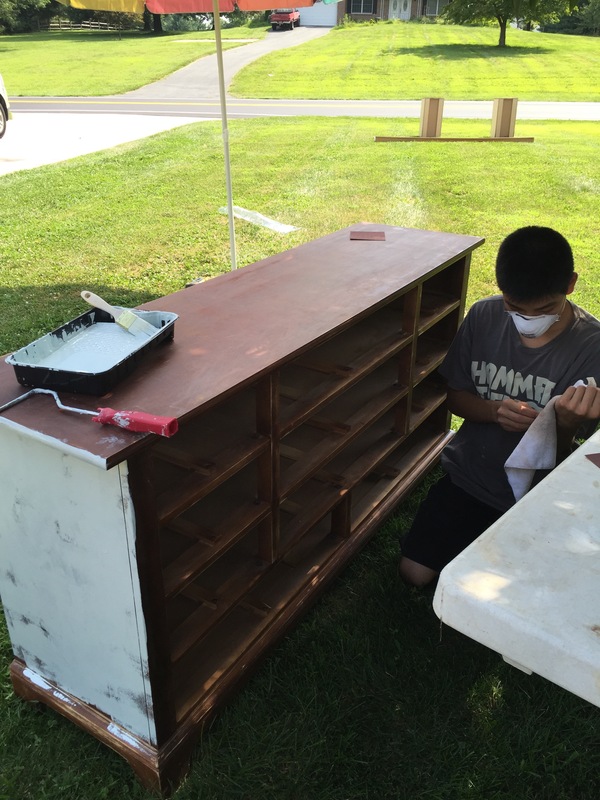 A week after my return to the beach the weather was so nice I decided to paint some furniture. I attacked the dresser emptying first. Maybe the best thing that will come of this is that I will get rid of stuff since I have to empty out all my drawers and clear the tops. That is a task in itself – I am surprised I didn’t quit for the day(weekend) after I did the emptying because it took a lot of moving around and sorting through and I had to store it in something(s). I am definitely not ready for a tiny house – (another HGTV reference). TBC – Thanks for reading…. 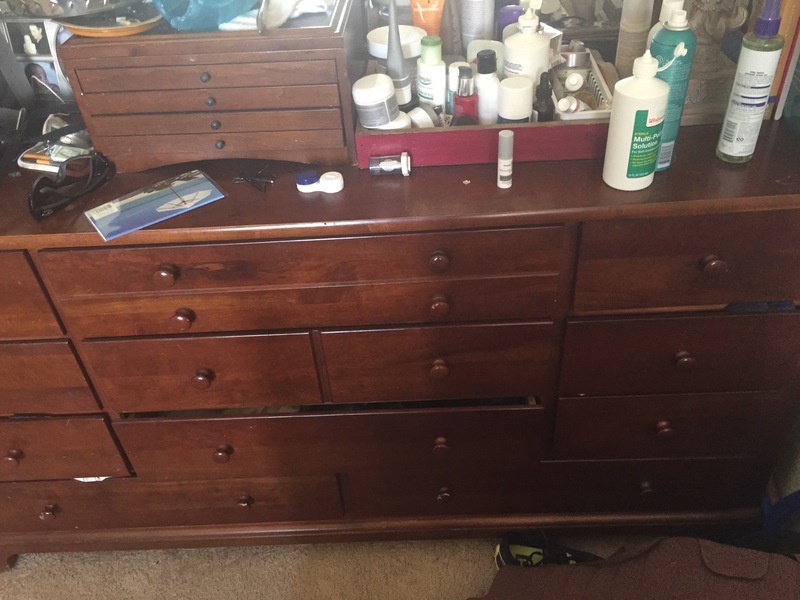 My dresser before. In my defense we had just returned home from the beach and I was still disorganized. I am hoping this will look much better in the After picture! My son was my sander and he did a great job prepping my stuff. I highly recommend and assistant if you can get one. This help earned him an Ipod shuffle. He took his old one in the ocean with him- it did not survive.